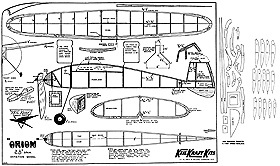 Bud Caddell's A36 Bonanza (Conventinal tail) CORRECT FILE ADDED. Description: 86" Wingspan prototype powered by a Webra .91 and designed for Rohm air retracts but compatible to the Robart retracts for the top Flite Bonanza. Plans show grooved control surfaces but the plastic panels are no longer available. I plan to use a Dremel router to replicate on balsa. The build will need to make their own canopy and cowling. A short kit is available from Limey Bob at Laser Design Services he can also provide a hardcopy of the plans with short kit order. see http://store.laser-design-services.com/index.php?main_page=product_info&products_id=72 for free dowload inc build article. Correct plan is linked now. Sorry about that. Sorry for the confusion! I was having some problems downloading. Fortunately Ratz was able to help. I have purchased the Robart Top Flite Bonanza gear to use in this airplane. The cowl, Canopy and corrugated surface skins are no longer available so they all must be made. On the skins I saw a technique another modeller used on similar surfaces. He made a jig and used a Dremel routing bit. I plan on using my Dremel 1/8" shaft router bit and router attachment with a yet to be built jig. The router will stay stationary and just the stock moves. pencil marks will be used to line up on and the jig will have stops to keep the routed lines even.